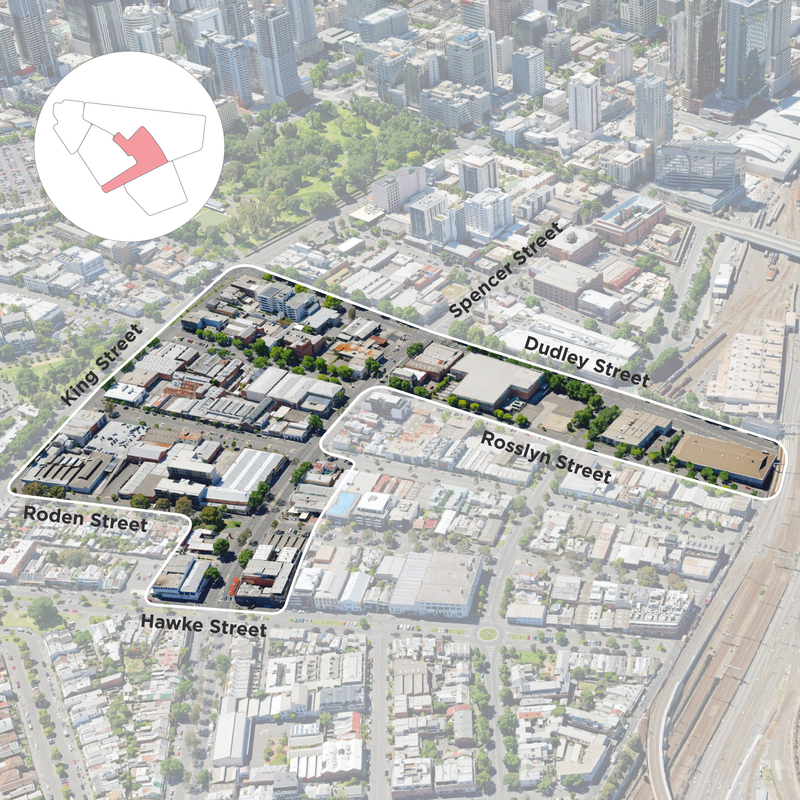 Proposing new planning controls to guide the development and use of land in West Melbourne. Melbourne Planning Scheme Amendment C309 implements the West Melbourne Structure Plan by introducing new tailored planning controls in the Planning Scheme. This will guide the use and development of land and celebrate the character of West Melbourne as outlined in the Structure Plan. The plan was endorsed by the Future Melbourne Committee in February 2018. Amendment C309 proposes to implement the built form and land use directions of the West Melbourne Structure Plan 2018 by introducing new planning provisions into the Planning Scheme to guide future land use and built form in the area. Rezoning some areas to a specifically crafted Special Use Zone will help support a genuine mix of uses in West Melbourne. Minimum employment floorspace requirements are included in the Special Use Zone to support a greater mix of commercial uses in West Melbourne. Commercial floorspace requirements will help to deliver the projected 10,000 jobs in West Melbourne by 2036. Spencer Street will become the local high street of West Melbourne with shops, cafés and restaurants. The Special Use Zone will support the delivery of the high street. Active uses at street level will be encouraged. A six per cent affordable housing target in the Special Use Zone will help deliver around 200 affordable dwellings in West Melbourne. 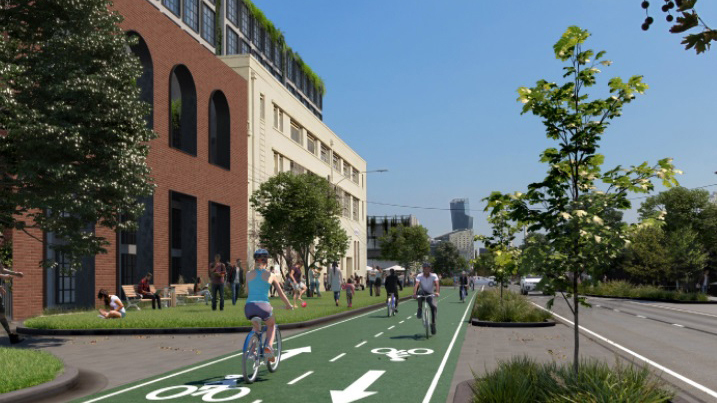 New parking controls will encourage sustainable transport and more efficient use of unused parking spaces in West Melbourne. 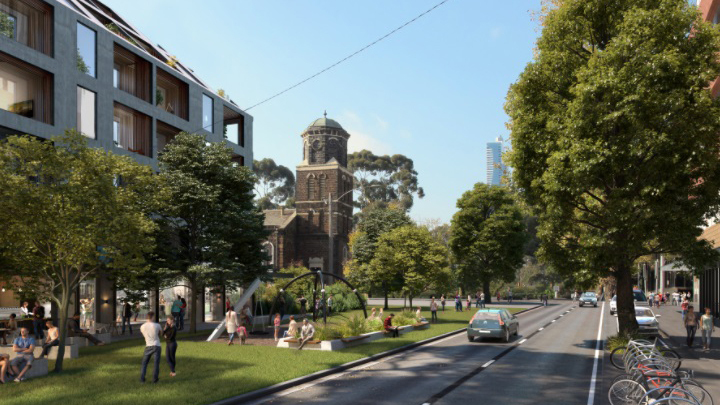 West Melbourne has evolved to include a mix of building types and uses, from low-rise heritage cottages in the north, mid-rise factories and warehouses in the middle, to larger scale, high-rise apartment buildings in the south. 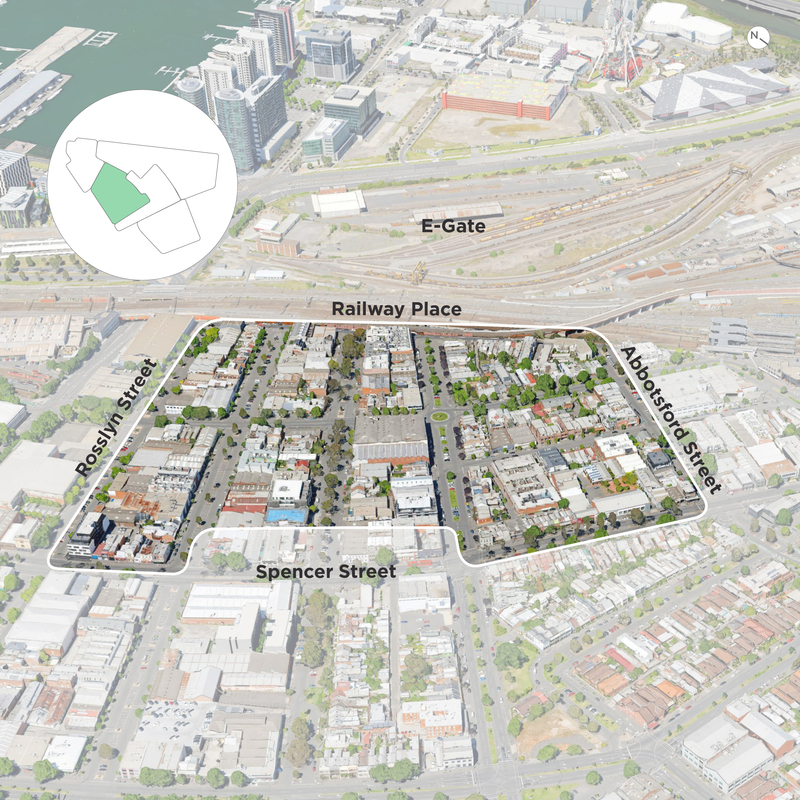 The Structure Plan and Amendment C309 take a character approach to planning for the future of West Melbourne and have identified distinct precincts based on their character. New floor area ratios and built form controls will ensure that any development responds to the vision and design objectives for each precinct. These controls include maximum floor area ratios and preferred maximum building heights to ensure buildings respect their context and buildings types are diverse. 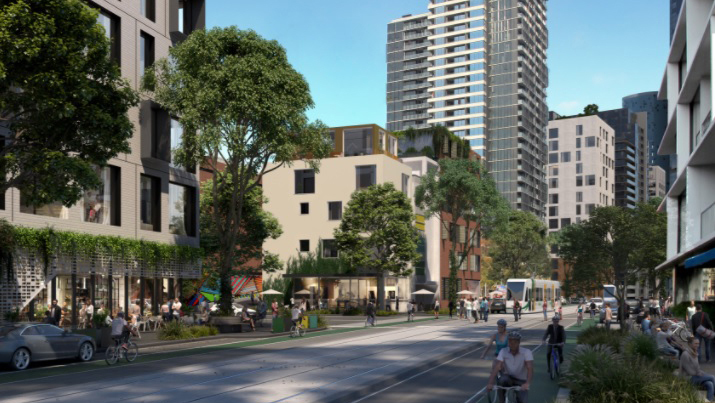 Amend Clause 21.16 Other Local Areas in the Municipal Strategic Statement (MSS) to insert a new Clause 21.16-6 West Melbourne, to ensure the vision for the area reflects the Structure Plan and update Clause 21.16-5 to only refer to North Melbourne. Amend Clause 21.17 Reference Documents to include the West Melbourne Structure Plan 2018. Rezone recently expanded and existing new public open spaces to the Public Park and Recreation Zone (PPRZ). Amend existing Schedules 28, 29 and 33 to the Design and Development Overlay (DDO28, DDO29 and DDO33) and add a new Schedule 71 (DDO71) to implement the built form controls and design recommendations in the Structure Plan. The DDOs will include a mandatory Floor Area Ratio (FAR) as well as provisions to encourage the retention of buildings identified as character buildings. Apply an Environmental Audit Overlay (EAO) to the Structure Plan Area to ensure that potentially contaminated land is suitable for a sensitive use. Amend the schedule to clause 72.03 to include references to the new EAO map in the Melbourne Planning Scheme. Apply a new schedule to the Parking Overlay (PO14) to introduce a maximum parking rate of 0.3 spaces per dwelling. Rezone most of the Mixed Use Zone (MUZ) in the Structure Plan area to a Special Use Zone (SUZ6) to deliver a true mix of uses. require active ground floor uses along Spencer Street, between Hawke Street and Dudley Street to help deliver a new activity centre. 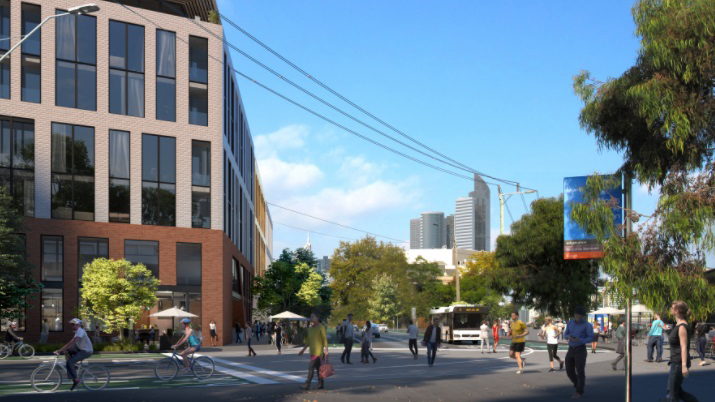 Amendment C309 will affect new development in West Melbourne. If you want to develop or change the use of your land, the new planning controls introduced through Amendment C309 will be considered by Council officers before making a decision on a planning permit application. To see the boundaries of the precincts, see precinct map. To find out how your property is affected, please review the Amendment documents located in the Document Library on this page. 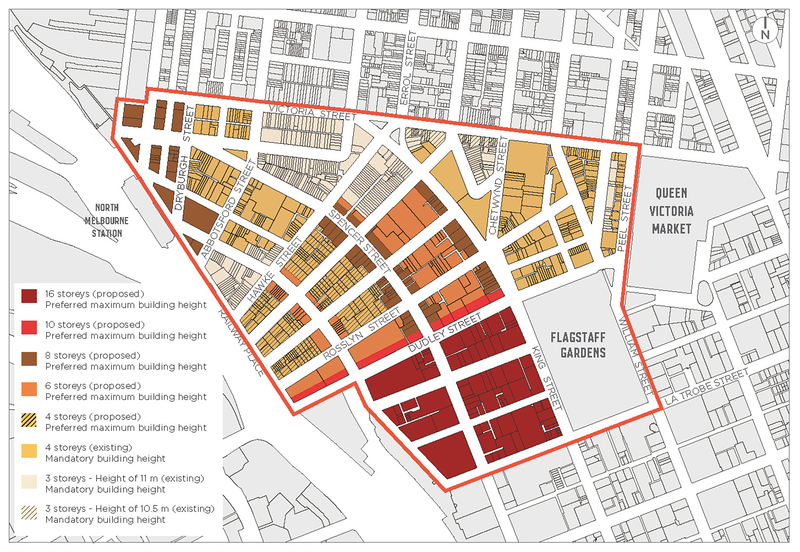 For an overview of the proposed and existing building heights in West Melbourne, see building heights map. 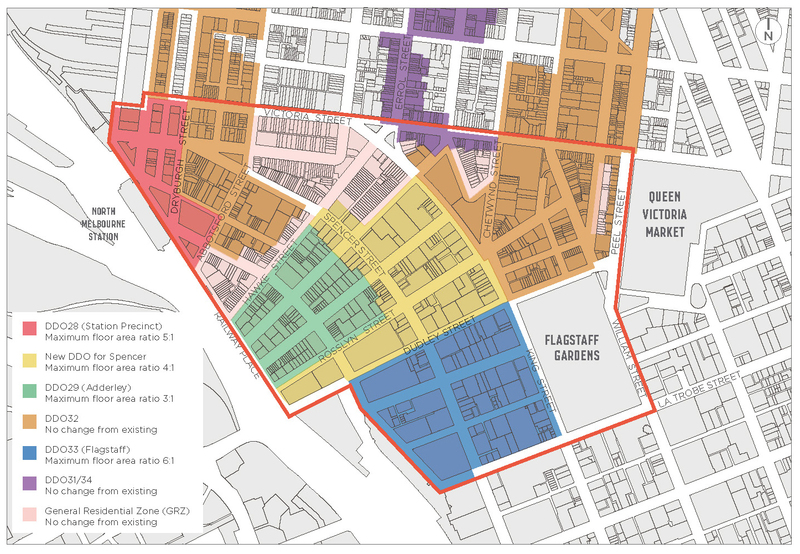 For an overview of the proposed maximum floor area ratios, see design and development overlay map. It is important to note that the Melbourne Planning Scheme is a detailed document and various planning scheme policies and provisions can apply to your property. To find more information, visit Melbourne Planning Scheme. What is a floor area ratio? 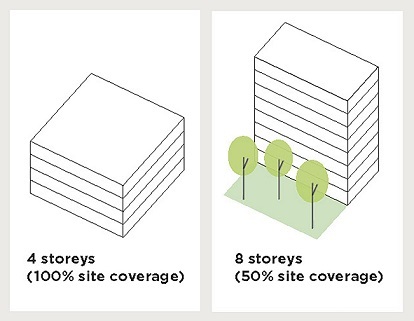 A floor area ratio sets out a specific level of development that can occur on a site. The floor area ratio is the ratio of a new building’s total floor area in relation to the size of site it is being built on. The diagram below illustrates the concept of floor area ratios and how it can result in different building types. For example, a floor area ratio of 4:1 allows for a total floor area up to four times the size of the site itself. This could be up to four storeys if 100 per cent of the site is developed or eight storeys if only half the site is developed. Floor area ratios will allow for a variety of building types in certain area. When combined with built form controls, floor area ratio controls will create a flexible framework in which multiple successful building forms can be achieved. What does the plan outline? West Melbourne is a long-established area with a strong community, diverse mix of housing, warehouses and businesses, and a rich cultural and architectural heritage. 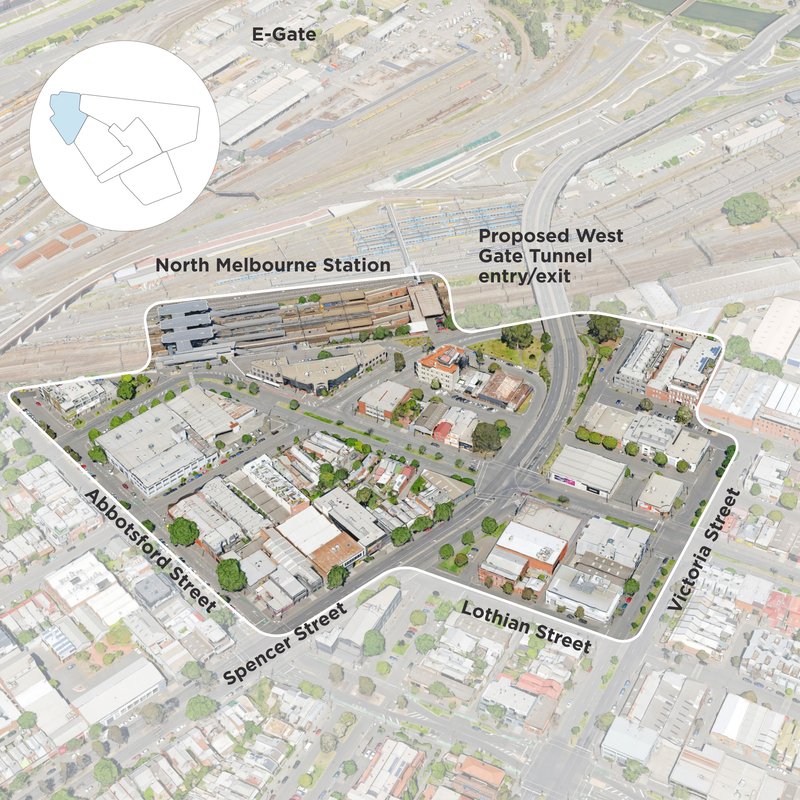 The new Structure Plan guides the development of future growth in West Melbourne. For further information, visit West Melbourne Structure Plan. Once public exhibition of the amendment is completed, all submissions will be considered by Council. Under the Planning and Environment Act 1987, Council can decide whether to make the changes requested by submitters, abandon the amendment or request that the Minister for Planning appoint an independent panel to review and hear submissions. Before making a final decision on the amendment, Council will consider the independent panel’s advice. If the amendment is adopted by Council, then it will be submitted to the Minister for Planning for final approval. For more information, see planning scheme amendment process. Adderley is located in the western part of West Melbourne bounded by Spencer Street, Railway Place, Abbotsford and Rosslyn Streets. Flagstaff is located to the west of Flagstaff Gardens bounded by King, La Trobe, Adderley and Dudley Streets. Historic Hilltop is located in the northern part of West Melbourne adjacent to North Melbourne and is bounded by Peel, Dudley, King, Roden, Spencer, Lothian and Victoria Streets. Spencer is located in the centre of West Melbourne bounded by Roden, King, Dudley, Rosslyn and Spencer Streets. Station Precinct is located around North Melbourne (future West Melbourne) Station and bounded by Abbotsford, Spencer, Lothian, Victoria and Laurens Streets and Railway Place. Adderley will have an eclectic mix of uses, tucked away from the busy thoroughfares of West Melbourne but with great views of the city and Docklands. Flagstaff will be a busy, diverse area of mostly residential and commercial buildings that is well connected to the iconic Flagstaff Gardens. Station Precinct will be a thriving area of converted warehouse apartments and new mid-rise residential buildings defined by the edge of the railway escarpment, views towards the industrial heritage of the west and busy transport nodes at station entrances. Spencer will be a vibrant, inner-city mid-rise area with a mix of retail, commercial, residential, community and creative uses spilling out onto its streets. Potential concept for the reconfiguration of the Hawke, Errol, King and Victoria Streets intersection. 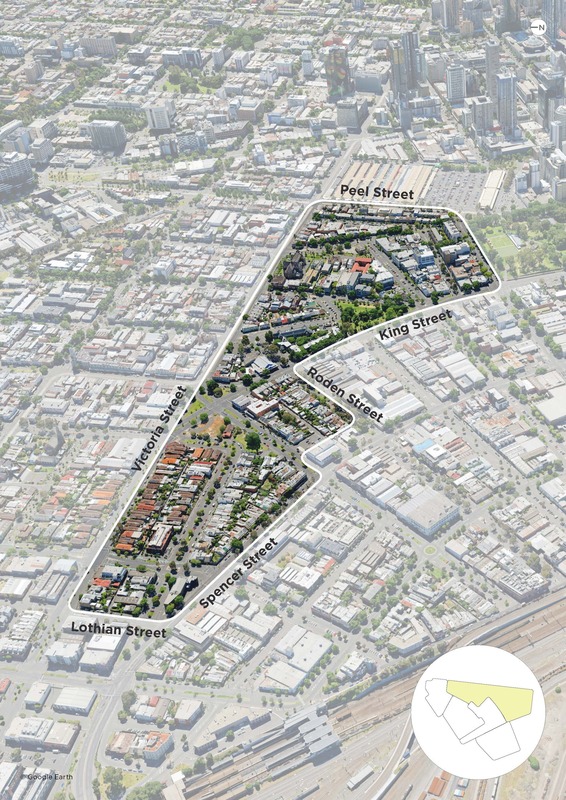 The structure plan guides the development of future growth in West Melbourne. Here are the latest updates on the project's progress. Formal public exhibition on Planning Scheme Amendment. An overview of the density and built form, and activities, uses and infrastructure in each West Melbourne Precinct. New development in Adderley will be respectful of the existing built form and the heritage overlay that applies to a large part of the area. Building heights of between two and four storeys will create a mid-rise precinct that responds to adjacent low-scale heritage buildings. Adderley will have a mix of uses including cafes, restaurants with small art spaces, and offices scattered throughout. This will be achieved through the rezoning of land from mixed use zone to special use zone, and minimum requirements for employment floorspace. A mix of uses will be included older buildings and new buildings. 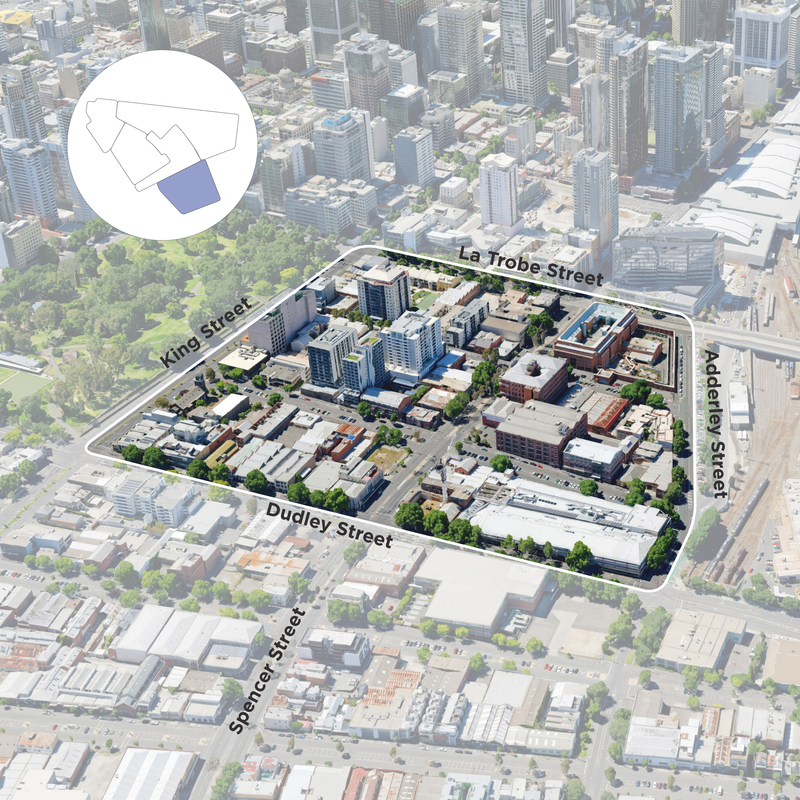 Flagstaff will continue to evolve as a central city fringe precinct with a mix of tower and podium development with a range of other building typologies. The tallest buildings will be around 16 storeys, with smaller sites and mid-block sites accommodating a lower built form. 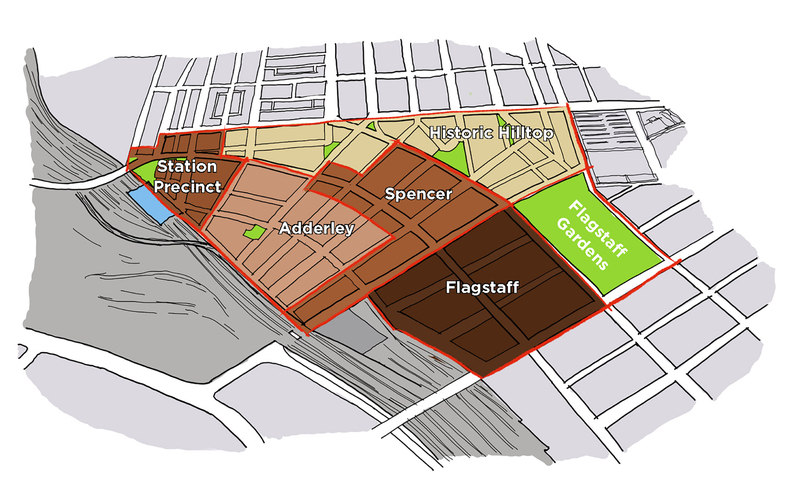 Flagstaff will have a mix of uses including residential, businesses, institutions, schools, and higher education colleges, as well as community facilities. Rezoning the area from mixed use zone to special use zone, and minimum requirements for employment floor space, will ensure the area continues to create local employment opportunities. Rows of workers’ cottages, Victorian terraces, and Federation homes provide uniformity to the residential streets, and intact historic shopfronts and awnings line the shopping strips. Landmark buildings such as St Mary’s Cathedral occasionally punctuate the skyline. The current built form controls that apply to the area will remain the same with new buildings a maximum height of 14m. This is a mostly residential area with retail along Victoria Street and Peel Street and a mix of commercial and community uses east of Chetwynd Street. Spencer will be a mid-rise area that supports high quality design, with new buildings a maximum of eight storeys tall. Higher built form will be focused on Spencer Street, Dudley Street, and King Street, with lower built form on side streets. In contrast to the central city, tower and podium towers will not be supported. 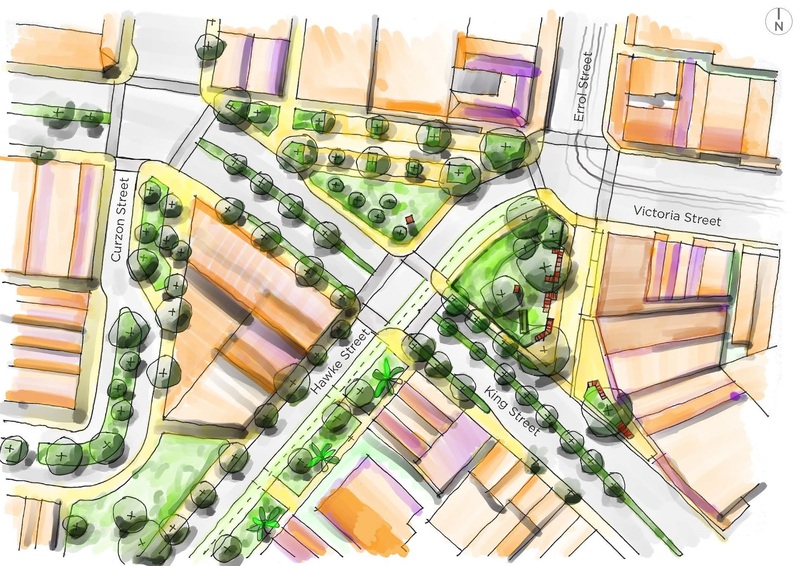 Instead, alternative typologies that respond to the characteristics of individual sites will be expected. Former warehouses will be reused or sensitively redeveloped to retain a sense of history. Spencer will be a mixed use area focused around the busy local high street on Spencer Street, lined with shops, cafes, restaurants and bars south of Hawke Street. Some of these uses will turn the corner into the quieter, greener side streets. Mixed use will be achieved through rezoning Spencer to a special use zone, with a minimum requirements for employment floor space. The built form of Station Precinct will be a mix of warehouse conversions, contemporary developments, heritage cottages and terraces of a discretionary maximum height limit of eight storeys. A cluster of shops, cafes, restaurants and bars around North Melbourne Train Station will be supported by the increasing number of local residents and passing commuters walking to Arden, Docklands and E-Gate. This will be delivered through the rezoning of land from mixed use zone to a special use zone and minimum requirements for employment floor space. This document is 1,700 pages and contained within a May 2017 report from the Future Melbourne Committee. It is divided into two parts. A planning scheme is a legal document that sets out planning policies, zones, overlays and other rules affecting how land can be used and developed in the municipality. It sets out what we can and cannot do on different areas of land in the city. For example, but is not limited to, whether the land can be used for housing or a shop or business, what the height of a building should be, and how much open space should be provided. As our city grows and changes, planning controls may be changed or updated to reflect the new circumstances. A change to the planning scheme is known as an amendment. The process for an amendment is set out in the Planning and Environment Act 1987. The amendment process has a number of steps. For more information, visit planning scheme amendment. If you have questions or want to learn more about Amendment C309, contact us below.